Welcome to the Jazz Record Center! Since l983, the Jazz Record Center has conducted mail auctions, bought/sold/traded LPs, CDs, books, videos, magazines and jazz ephemera. We are always interested in purchasing collections -- large or small -- of jazz LPs, CDs and literature in excellent condition. Send, e-mail or fax your disposal lists. You can order books and videos online with our secure ordering system. and mail to us, or you can call, fax, or e-mail us your order. that you can order directly from the New York Store. We are currently doing periodic auctions on eBay. Approximately every two weeks, we list rare ephemera (concert programs, autographs, photographs, flyers, etc.) and LPs culled from collections we purchase - all original pressings in top condition. We have also greatly expanded our CD inventory, focusing on small independent and foreign labels, e.g. Nagel Heyer (Germany), Eremite (USA), Venus (Japan), Clean Feed (Portugal), Enja (Germany), and many more. Write or e-mail us if you have specific wants. 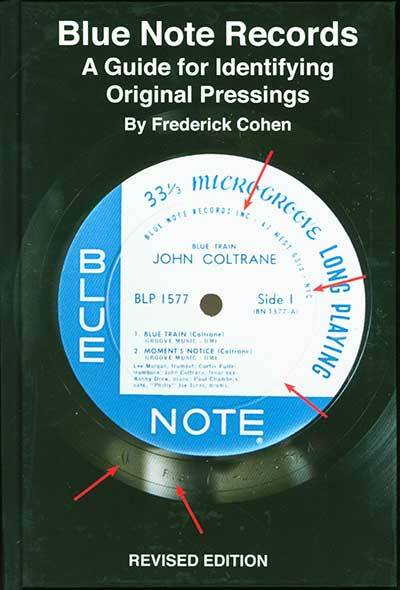 From thousands of first-hand examinations of Blue Note records comes this exhaustive guide to identifying the many details that determine what is - and what is not - an original Blue Note pressing. Every EP, 10" LP (5000 and 7000 series), and 12" LP - mono and stereo - from the 1200, 1500, and 4000 series up to BLP 4252, is separately listed, with descriptions of the important record and cover details. The guide also includes chapters on promo-only mono issues, label transition periods, release dates for 10" and 12" LPs, label chronology for 12" pressings, inner sleeves, rarities, as well as commentary by Rudi Van Gelder about his Blue Note stereo recordings. Over 100 color and black & white photographs assist the reader, identifying important (and often elusive) details that qualify each record as an "original". This is an indispensable reference for modern jazz LP collectors that, for the first time, assembles all the information previously available only to dealers or the most experienced collectors. The guide will help buyers make informed decisions about their next record purchases, preventing costly mistakes while strengthening the value of their collections. You can order books and videos online with our secure ordering system. You can also order with credit card or check using an order form that you can print out and mail to us. We have our books and videos online but there are many more products that you can order directly from from the New York Store. Our	selection of Laser Disks and DVDs encompasses the complete range of the jazz-on-video experience. All videos are new commercial releases, though some are in limited supply and once they are sold, cannot be restocked. We will be happy to special order any currently available video that is not in our inventory. Click hereto visit our video selections. We stock approximately 1,000 in-print and deleted paper and hardback books on jazz and blues in many categories. We also carry a large selection of foreign and domestic photo books. As with videos, we will special order any currently available title. Click here to visit our book selections. Unusual items from our inventory, e.g. posters, equipment, ephemera. Click here to see some more stuff. The New York Store carries many additional products. Click here to see what we have and how to contact us. Subscribe to our mailing list for occasional announcements of E-Bay auctions and other special events. Copyright Jazz Record Center ALL RIGHTS RESERVED. At Jazz Record Center, we buy and sell LPs, CDs, books, music videos, magazines, jazz books and blues and jazz ephemera. We carry many record labels like Avant Garde Transition Blue Note Prestige EmArcy New Debut Candid Riverside Atlantic BYG/ACTUEL Impulse Pacific Verve Savoy Mosaic ESP Cobblestone and many artists like Miles Davis John Coltrane Charlie Parker Duke Ellington and Count Basie.